Moab s best deal clean rooms friendly staff complimentary hot breakfast Indoor-Outdoor Pool and Hot Tub Free WI-FI Business Center Hospitality Room and much more The Moab Valley Inn is conveniently located on Main Street in beautiful downtown Moab. Clean spacious rooms appointed with new flat screen TV s free WI-FI refrigerators coffee makers hair dryers iron and ironing boards while our deluxe suites also include a jetted bathtub microwave and wet bar. 100pct Non Smoking facility for your comfort. 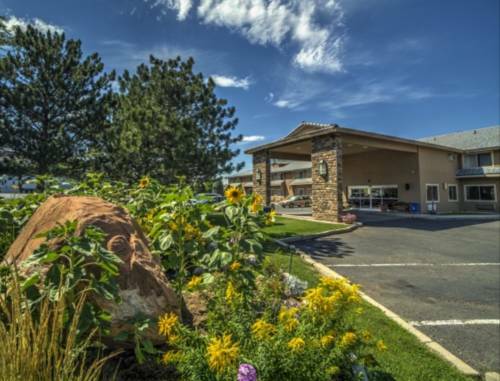 The Moab Valley Inn also has state of the art conference facilities. Let our experienced staff assist you in planning your next wedding retreat business conference reception social banquet event registration or fair. The Moab Valley Inn is conveniently located on Main Street in downtown Moab. Just 20 miles from Canyonlands Air Field and 30 miles from Interstate 70. All reservations require a valid credit card at time of booking. Reservations must be cancelled 48 hours prior to arrival to avoid a penalty of one night room and tax. A giant watermelon slice on wheels -- a familiar sight in Green River's annual Watermelon Days festival -- is now parked year-round for viewing by visitors. Celebrated decapitated chicken that lived -- for a while. The town has a sculpture of Mike, and an annual Mike the Headless Chicken Festival. A life-size buffalo sculpture is made entirely of polished chrome car bumpers.